It’s quite a while since I’ve done a book review but I could not resist writing about this one. It was the last book we read for the Short Book Club and while it has been around for a while all but one of us had missed it. Probably the name was a bit off-putting! But one member’s recommendation was so enthusiastic that we chose it for our seventh anniversary meeting. Yes, seven years ago in the Fall, we met for dinner at our convener’s house for the first time and recently every single one of us were there for this meeting, although we had no idea until that night that it was our seven year anniversary. 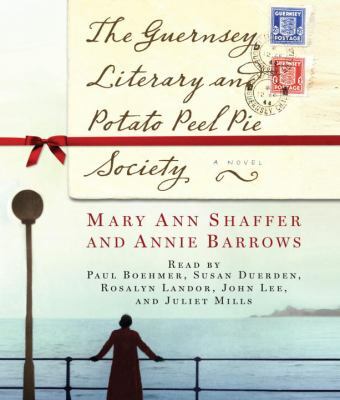 The Guernsey Literary and Potato Peel Pie Society* by Mary Ann Shaffer is an epistolary novel, one written in the form of letters. While not much in favour these days, it seems just the right format for this delightful novel, although it can be a bit confusing at times since there are many letter writers contributing to the whole. Set in 1946, in the days just after the Second World War, the book commences as Juliet Ashton, a thirtyish author, writes to her publisher bemoaning her lack of ideas for a new book and also wanting to write about something completely different. She receives a letter from a farmer on Guernsey with a query and an exchange of letters begins. He tells her about the Guernsey Literary and Potato Peel Pie Society, a rudimentary sort of book club and describes how the whole thing began during the German occupation of that island. Other members of the society begin to correspond with her, narrating their wartime stories and the idea for a new book is born. Through these letters the reader not only gets to know the various characters and “characters ” they really are, but also the realities of the German occupation are revealed little by little. Of course Juliet must go to Guernsey to meet these people and thus we see them first hand in her letters to others. To my mind, their stories, along with her own, are carefully interwoven most successfully using this format and revealed little by little. While being quite informative the whole book has a very delightful, warm charming feeling, despite the often depressing reality of the years of the occupation and the post war situation. This book delivers a touch of romance, some sadness and some humour, along with a lot of information and a satisfying conclusion. What more can one ask of a novel read for entertainment? I am sure that most everyone has already read this book, but if not I can highly recommend it and my copy has already been passed on. * Annie Barrows, Mary Ann Shaffer’s niece completed the book after the author’s death. This is the cake which I will take for dessert to the meeting of my Short Book Club tomorrow. Yes it does look a little plain but it is delicious and dobs of whipped cream dress up any cake you know. For me this is a very special cake, Sunken Grape Cake, a cake with a story, which I would like to share with you. The recipe* was given to me by a dear friend, C, who sadly passed away a several years ago from cancer. Below are parts of the eulogy I gave at her memorial service, which was a story in itself as I had viral laryngitis but could not persuade anyone to read the eulogy for me. So I croaked into the microphone and what with my accent and my defective voice I am sure no one understood a word. C was not one of those friends of very long standing whom I met when I first came to Canada. In fact we first met in the early nineties, when we belonged to the Pfaff Club, both owners of a Pfaff computerized sewing machine and together we learned the intricacies and capabilities of our new toy. Later, in the mid nineties, we crossed paths again as I joined the Islanders group of the Faculty Women’s Club, of which C was a long time member. Then when I retired fully in 1998, I joined many of the other interest groups of the Club and she seemed to belong to all the same ones as I did. So we quickly became friends due to our common interests. She was from Edinburgh, my father was from Glasgow, I had traveled in her homeland and was interested in the stories of her life there. We both had lived in London for a time and both had traveled widely. We shared the immigrant experience, coming from far away places to settle in Vancouver and to my mind we just seemed to be kindred spirits. We spent hours talking on the phone and often went together on the various outings of the club. The more I got to know her, the more I realized what a wonderful, kind, generous person she was. She was the first person to extend a helping hand, to give someone a lift, to lend something she had to anyone who needed it and to welcome all the new people who joined the Club, either for short periods or for longer ones. But it was really hard to reciprocate because she wouldn’t let you do things for her. On one occasion I was able to lend her a navy blazer for a sail past she was to attend with her husband. I was so happy to be able to do something for her for a change, but of course when she returned the blazer it had been dry cleaned and was accompanied by a clematis plant in a pot, which I still have to this day. C. loved food. She was a wonderful cook. She knew all about food ingredients and all the classic and nouveaux ways of preparing food. She always knew what the exotic things were in the recipes or on the plate when we lunched out together. She knew all the best restaurants and she formed our little group of five people, the Lunch Bunch, who ate out once a month when we tried all the new or different restaurants which, usually, she discovered. She was a gracious hostess and constantly tried new recipes which she discovered in books, on the Food Network and online. We always teased her about watching the Food Network. She also generously shared these recipes with her friends. 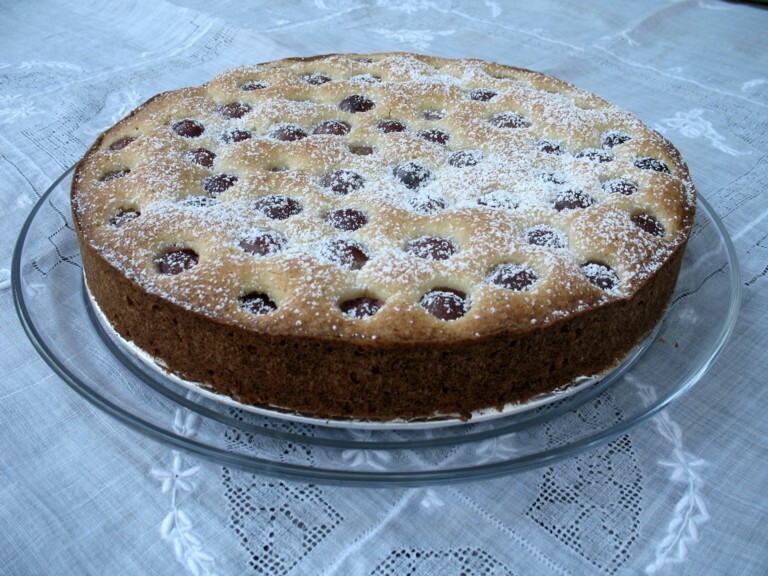 In fact one of the recipes, known as C’s Sunken Grape Cake, has a life of its own. We all seemed to make it often and bring it to various events. We had to check with each other, is C bringing it, or someone else perhaps, to whatever occasion for which we were asked to provide cakes or squares. We even shared it with other friends so there are people who never knew C making it. In fact, someone brought it to the the reception after her memorial service and there were people at the reception who asked me for the recipe which I dutifully emailed to them since I knew she would have graciously offered it if asked or even if you only said I really like that cake. I admired C greatly for her goodness, her kindness, her generosity of spirit and her genuineness. But most of all I admired her for the way in which she handled the last few months of her life, with such grace, courage and dignity. C was co-convener of the Thursday Walking Group, as I am now. I’m sure you know what a close-knit group we are as we go for a walk in various places all over the Lower Mainland and always have lunch together afterwards. Some of the members, who are unable to walk so far now, or have various periods of incapacity due to injury or whatever, often meet us for lunch anyway. So, as C underwent various tests to discover the reason for her ill health, we all worried along with her. When she phoned to tell me the definitive diagnosis she said, “I don’t want you to feel sorry for me. I don’t want people to treat me differently and I don’t want to talk about it.” I hope we didn’t treat her differently but of course we talked often about it. How could we not? It took over her life and she herself brought it up all the time. But she never gave up hope, even when the medical profession could do nothing more for her. She was always cheerful when we spoke, in person or on the phone. On December 8th, 2005, the walking group met for a Christmas pot luck lunch at a member’s house. C was determined to be there and her husband did indeed bring her. She was frail but beautifully groomed and dressed, as always, with her lovely smiling face and her spirit shining through. We were all delighted to see her. It was a very joyous occasion and 14 of us sat at the table and celebrated the season and the fact that she was able to be there with us. Someone took some wonderful pictures with her digital camera, to memorialize the occasion and she sent them to C. Most of us did not see her again (she died ten days later), although we all phoned regularly and if she was not well enough to talk to us, we talked to her answering machine. And we wrote cards and sent flowers, anything to show her how much we cared. We all miss our dear friend C and talk about her often. Yes, she belonged to the Short Book Club too, so it is fitting that we eat her Sunken Grape Cake at one of our meetings, don’t you think? * Recipe for this Sunken Grape Cake can be found here, although it is actually the creation of Monique Sui, co-owner of Zefiro in Portland. I’m supposed to be retired but life seems to be just as hectic as when I was working. Not only have I been very involved with online administrative duties, conducting a vote and writing a voting report for Blogpower, but there have been several real life meetings for an Association of which I am a director and writing minutes for those. I seem to spend my whole life in front of the computer, either composing documents or answering emails. I haven’t even had time to go to Second Life and take JMB Balough out for spin, to practice walking you know. She’ll be getting mad at me and she definitely needs the practice. Tonight is the meeting of my Short Book Club and I have to read the last few pages of The Alchemist by Paul Coelho. Luckily it’s a very short book else I would not have near finished it. Oh, did I tell you that I am having my second eye surgery on Wednesday so I am juggling the old eye drops four times a day? I have to remember to put them in the correct eye, the left one, since I spent four weeks putting them in the right one. It’s no wonder I am having trouble keeping it straight. I’m not quite so nervous as I was last time. 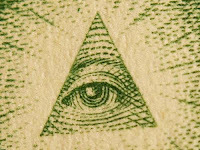 I know that I have at least one good eye with twenty/twenty vision. The ophthalmologist has decided to use a different lens this time, since he had such trouble last time, with me squeezing my eyeball. I still maintain that it is not possible to squeeze one’s eyeball, especially with the eye held wide open by some torture device. Anyway, this will explain if you don’t see me around for a bit, either visiting or posting. I plan to be back for sure by Saturday Photo Hunt, but perhaps I will be around sooner. I do hope so. Now wish me luck. This time I will just take the double vision in my stride! Back soon, better than ever. It will be fine! It will be fine! It will be fine! I’m supposed to be retired but life seems to be just as hectic as when I was working. Not only have I been very involved with online administrative duties, conducting a vote and writing a voting report for Blogpower, but there have been several real life meetings for an Association of which I am a director and writing minutes for those. I seem to spend my whole life in front of the computer, either composing documents or answering emails. I haven’t even had time to go to Second Life and take JMB Balogh out for spin, to practice walking you know. She’ll be getting mad at me and she definitely needs the practice.